With a Joe Wright film, we have come to expect creative storytelling, memorable visuals, and soul pleasuring musical scores from the hands of composer Dario Marianelli. PRIDE AND PREJUDICE and ATONEMENT well rewarded both director and composer in 2005 and 2007 respectively. In 2010, Wright began to venture out, leaving the romantic shores of Jane Austen and Iwan McEwan behind, to deliver the coolly received film, THE SOLOIST. Despite the film's critical failure, Wright nonetheless maintained his working relationship with Marianelli and gave us one of 2010's more inventive scores. Wright's latest effort, HANNA, boasts a brilliant cast of Saoirse Ronan, Eric Bana, and Cate Blanchett in a location-hopping, modern-day, fairy tale, that just so happens to have a "Jason Bourne" playing the little princess. A brave and intriguing combination. No? But what sort of musical score would a movie comprised of such divergent parts demand? For HANNA, Wright tests the waters of experimentation even further by bringing on the famous DJ/Dance producers, THE CHEMICAL BROTHERS, to score their first-ever picture. The big question, then, is whether Wright's visual storytelling and the Brothers hard-edged, electronic, explorations work well for a feature-length film and well enough to make audiences happy ever-after. That question is answered at about the 30 minute mark of the film. 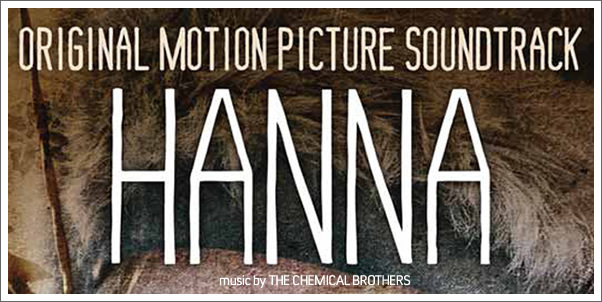 If you haven't seen HANNA yet, it might surprise you that there actually is no score for the first 30 minutes. Now, this is something I might be inclined to complain about - but in truth, these scenes set in the seclusion in or near the arctic circle are the most engaging of the film and promise a more direct and traditional brand of storytelling than the rest of the film delivers. As the story progresses “Little Assassin Hanna,” who's lineage and existence appears dubious at best, must leave the safety of her confines and is swept into a world she only knows through books and her father’s instruction. She sets out on a modern-day-Grimm-fairy-tale. Not only is Hanna thrust into a strange new world, but Wright's choices in the telling of her tale, sweep the audience along for the violently magical ride.